This book may not be reproduced in whole or in part, except by a reviewer who may quote brief passages in a review, without the written permission of the publisher. To the generous members of the Unsplash community, whose images grace these pages. Are you sure it’s worth getting upset about? What is it that you think you can control? If you never take the time to examine your beliefs, or to question your assumptions, you end up living unconsciously. When you live unconsciously, you live your life according to somebody else’s beliefs. You end up trying to meet somebody else’s expectations and not your own. We all inherit beliefs from our family, from the culture we live in, from the schooling we receive, and from the messages we are exposed to in the media. There is nothing wrong with that. It’s all part of the plan. You have to start somewhere when you arrive on the planet. But, at some point, you’ll be called to move beyond that starting point. A lot of us resist that call. It sounds unsettling, like too much trouble. Life often gives us quite a shove in our mid-thirties: a mid-life crisis. Some of us pay attention. What I noticed was a whisper inside that wouldn’t go away. It kept inviting me to look within and stop worrying so much about what was going on in the world around me. Sometimes, it would nudge me to read a book by a particular author, or to listen to someone speak, or to undertake a course of study. When we get these prompts and do something about them, we begin by exploring voices from within our belief bubble. Having been born into a Catholic family, my early exploration involved studying the works of various Catholic authors, but then something happened and I started reading more widely. I came across A Course in Miracles and, several years later, TheWay of Mastery, both of which encouraged me to examine what I thought was real, and challenged all my beliefs about God and what it meant to be human. Those works started me on the path to accepting responsibility for my life and opened my mind to the possibility that nothing was as I thought or believed it was. My hope, in sharing these insights, is that they may inspire you to question what you have been told, and to spend a few moments contemplating the possibility that things may not be as you have been led to believe. 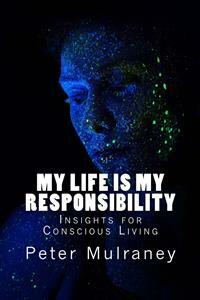 This book is an invitation to accept responsibility for your life, and to let others accept responsibility for theirs. A few words on how the book is structured. It’s not designed to be read from cover to cover in one sitting, and there is no order in which the insights should be contemplated. an image which holds the text of the insight,a discussion or expansion of that insight,a ponder point for you to think about, andactions for you to consider in relation to the insight. I recommend that you keep a journal to record your observations and insights as you work your way through the book. You may want to use the companion workbook I designed for that purpose. Until you come to the point of accepting responsibility for everything that happens in your life, you are not free. When you refuse to accept that your life is your responsibility, you continue to blame someone or something else for everything that happens to you. You see yourself as a victim of fate, a tyrannical god, controlling people, and natural disasters. You blame your parents, the government, and any person who abused you in any way for how your life has turned out. Accepting responsibility for your life is both confronting and liberating at the same time. It’s confronting when you have experienced things or committed acts you would rather forget than take responsibility for. It’s liberating because it lets you see that you are never a victim. How do we go about accepting responsibility for our lives? One way is to stop thinking of yourself as a human being with a limited lifespan and to see yourself as a spiritual being that chose to incarnate into the human form - for specific learning experiences. When you look at your life from this perspective, you need to acknowledge that you chose your parents and the circumstances into which you were born. From this perspective, you also come to appreciate that events happen for you and not to you. Things only happen to you if you see yourself as a victim. Another way of looking at that is to regard all events as neutral – that is; they happen but they have no intrinsic meaning. The only meaning any event has is the meaning you give it. You are the one who decides whether an event is beneficial, disastrous, or of no consequence. Accepting responsibility for your life means acknowledging that you have total control over the way in which you respond to any event. That’s why you hear all sorts of gurus telling you that change begins within. They're telling you that although you may not be able to change the world, you can change the way you behave. Accepting responsibility for your life also means you get to choose what you believe; instead of simply accepting what others tell you to believe. So, who or what has control of your life? You might think you are in control but, unless you’re willing to examine your beliefs and habits, you’re probably fooling yourself. Spend some time listening to what you say, and what you think but don’t say. Take a look at how you react when people push your buttons. Start keeping a journal to record your observations. One of the great temptations of life is to run other people’s lives for them. It’s a great distraction from running your own. Have you noticed how parents like to tell their children how to live their lives, even when they’re adults with children of their own? Most of the time you don’t even realize you’re doing it. Other times you do it on purpose – with the best of intentions, of course. After all, you do know what’s best, don’t you? The truth is you don’t know what’s best for another. It often takes a lifetime of inner work to discover what is best for yourself. The flip side is you often let other people run your life - whether it’s a spouse, a parent, a priest, some politician or the gossip down the street – or, more likely these days, on social media or talkback radio. Part of taking responsibility for your life is allowing others to take responsibility for their business while you attend to yours. That doesn’t mean that as parents of young children you let them do as they please, but it does mean that as your children grow and mature you need to transfer the responsibility for how they live their lives gradually over to them. Not always easy but essential. At some point, though, you need to be like the birds and push them out of the nest. How someone chooses to behave is not your business. What you choose to do about it - that’s your business. That’s the part you are responsible for. When we aren’t running other people’s lives, we often devote our energy to solving the problems of the world or complaining about things we have no influence over – activities which provide distraction or avoidance from the realities of our lives. Attending to your business, instead of trying to run the world, is actually a lot less stressful than worrying about things you have no control over. Funny thing is though, when you stop trying to run other people’s lives, they seem to do a good job of living them on their own, and you start enjoying your own life more. Whose lives are you interfering in? Who are you telling how to live their life or bring up their children? If you’re doing it professionally, keep in mind that doing it as an educator and not as a dictator will always be more effective. Observe how you relate to the people in your life, at home and at work. Are you trying to take care of their business? Notice whether you let others tell you what to do or what to think. Are you taking care of your business? Record your observations and thoughts in your journal. You can either let the circumstances of your life story dictate the path of your life - or you can choose a specific path for yourself. If you let your circumstances dictate, they could take you anywhere, because you are relinquishing any control you might have. This often seems the easier choice, which is why you hear motivational speakers challenge you to get out of your comfort zone. It’s called a comfort zone because you don’t have to do anything different if you stay there. But, you have to deal with whatever happens, and I hear a lot of people complaining about the hand life has dealt them. On the other hand, if you set your intention on living a certain kind of life, you signal your desire to the universe, and you can take action to move in that direction. This takes courage. Often it involves doing something different to everybody around you. It often means people will think (and tell you) that you’re crazy or too big for your britches. One of the interesting things about life is that it comes with an in-built feedback mechanism, which lets you know whether you’re on course or need to make a course correction. This means that, when unexpected things happen in your life, you can decide what they mean in terms of your life purpose. If you have a clear intention, you check your progress against your goals, those signposts you set to help you navigate from where you are to where you want to be. Can you imagine a ship leaving port without a destination marked on the map and a compass? Didn’t think so. It makes just as much sense for you to choose a destination before you set sail as well.